Organized by h_da’s Research Center for Digital Communication and Media Innovation (DKMI) in collaboration with GFTN e.V./Darmstadt, Master’s program International Media Cultural Work and World Forum for Acoustic Ecology. Further Keynote-Speakers will be announced soon. Soundscape Studies’ and Acoustic Ecology’s history has been connected to educational concepts since its beginning. A central thesis raised in R. Murray Schafer’s Acoustic Ecology is that a society’s willingness and ability to listen correlates to the quality of its sonic environment, signifying the overall relevance a community assigns to the realm of the auditory. Educational and facilitation concepts are therefore at the “logical” core of Acoustic Ecology, as they aim to broaden and sensitize auditory perception and apperception, and by this stimulate a sound oriented critical faculty and ingenuity. Schafer’s “Ear Cleaning”, his concept of “Soundwalks”, his workshops combining listening and sound creation, especially for schoolchildren, became the starting points for numerous further educational and enlightening concepts within the realm of soundscape. Practically all of them seek to emancipate the contemporary ear from the restricted and deprived auditory patterns of the everyday or the specialized, and sometimes normative listening methods of musical fashions and traditions. Many, if not most of them received tremendous responses by their participants. These active and experiential exercises have been gaining more and more acknowledgement; not only for auditory empowerment, but for reclaiming sensual awareness, engaging a broader public leading to an overall increase in aural acuity. Media, from audio media to the audiovisual up to interactive media and virtual reality, play a crucial role in almost any listening educational and facilitating approach, be it as an object of critical perception, a technical tool, an environment in which one can become creatively active, or in absentia. 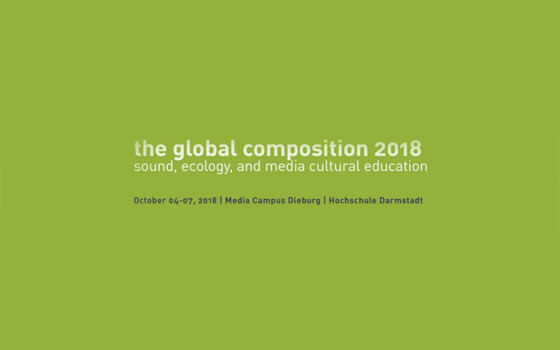 Therefore, listening and its manifold relations to media culture and media aesthetic education will be in the focus of the Global Composition conference 2018. Within the framework of this conference, we encourage submissions to go beyond notions which identify education merely as schooling, the instruction of a subject mastery, but understand it as implying to a large extent individual and communal maturation aspects as well as aspects of the formation and strengthening of a personality, group or culture. In this sense, the Latin root of education, educere means to lead forth. Our call for submissions invites suggestions for papers, posters, discussion panels, workshops, and artistic productions, focusing on the theme of “Sound, Ecology and Media Aesthetic Education”. Next-generation researchers under 35 years of age are especially encouraged to submit, and will be provided a special space to highlight their presentations. Please, remember that our selection process is based on the principle double blind peerreview. Therefore, you are kindly asked to make sure your name and identifying referencesare left out of the text of your submission.